For some time I’ve been wanting to really dive into the topic of quilting. After doing a lot of research I realized the 9-patch quilt block is the ideal place to start. What’s not to love here. It’s beyond simple ~ 9 squares of the same-sized fabrics. You can scale it up or down without much difficulty and come up with an array of possibilities. Add in a half-square triangle or two and get an entirely different quilt. 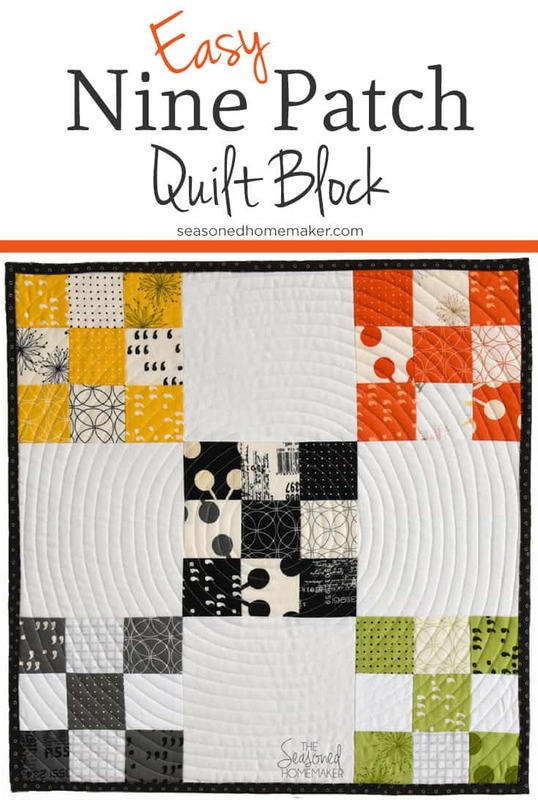 The Nine-Patch quilt block is one of the best blocks to start with if you’re a beginning quilter. It has officially been around since the 1800s and it is one of the most recognized quilt blocks in the quilting world. In spite of its simplicity, it has the ability to be changed dozens of different ways when paired with different blocks. Nine-patch blocks go waaayyyy back. Think Conestoga-Wagon-way-back. This block was popular with our nation’s pioneers because of its efficiency. A pioneer woman didn’t have fabric to waste. By cutting up simple squares she was able to use her precious fabrics wisely and keep her family warm at night. The simplicity of this pattern design made it ideal for teaching young girls how to sew (some as young as age 3 or 4) which was a necessary skill as our country expanded westward. I think the true beauty of this block lies in its history and and how it ties into the building of a great nation. As families moved West, women used their quilting skills to sew into the history of a growing country. In between homesteading the land, women found time to stitch together quilts as a necessity. These quilts played a vital role in their survival. They were not only used to keep settlers warm at night; they covered windows, doors, and floors. 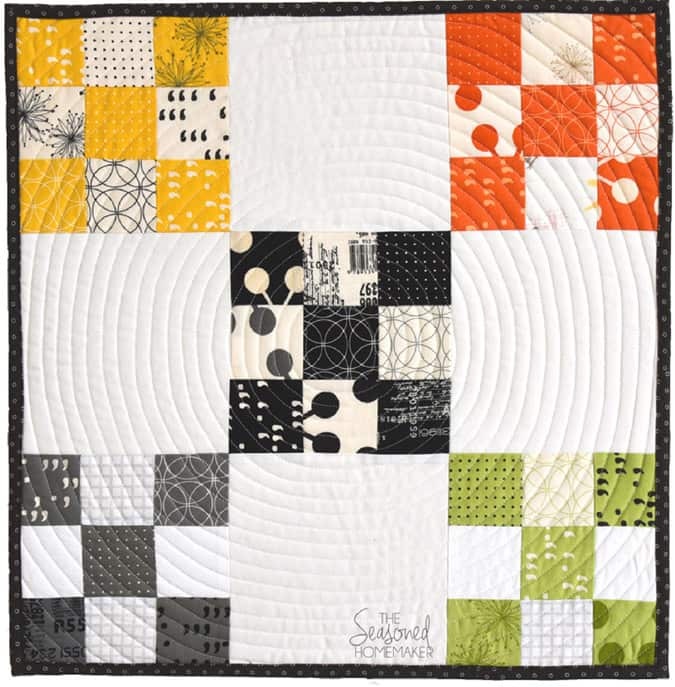 And the block that they used most often was the Nine-Patch quilt block. Most 9-patch quilt blocks look best when lighter value and darker value fabrics are paired together to form a small checkerboard. I think this block is ideal for using pre-cuts such as a 5″ square charm pack or 2.5″ mini charm pack. The most common way to assemble a nine-patch block is by attaching three uniform sized blocks across to form a single strip as illustrated below. For best results, use a 1/4″ seam allowance throughout your piecing. Keep in mind, you can size these up or down to suit your taste. As long as all the blocks form a same-sized square, you can go crazy with scale. Once three individual blocks are attached across they will create a strip. The nine-patch grid works best when it is done in an alternating grid. The first row should be Dark Square + Light Square + Dark Square. The second row should be Light Square + Dark Square + Light Square. The third row should repeat the first. 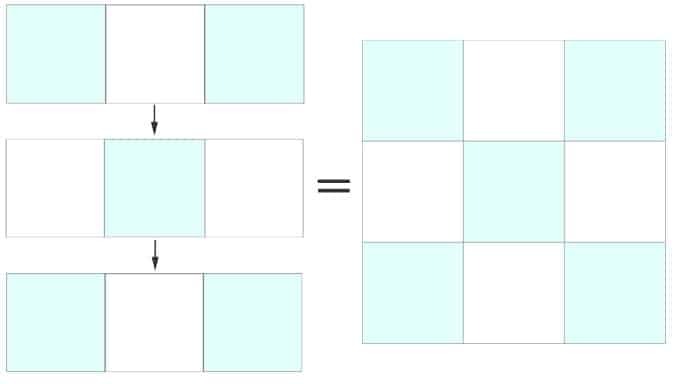 Once you’ve created your three alternating rows, connect them as illustrated below. It’s really that simple. Do you have piles and piles of scraps? I have some good news for you. A nine-patch quilt is a great way to turn those scraps into something beautiful. This quilt is the perfect example of a scrap-busting nine-patch quilt. It’s from the book, Block-Buster Quilts: I Love Nine Patches. 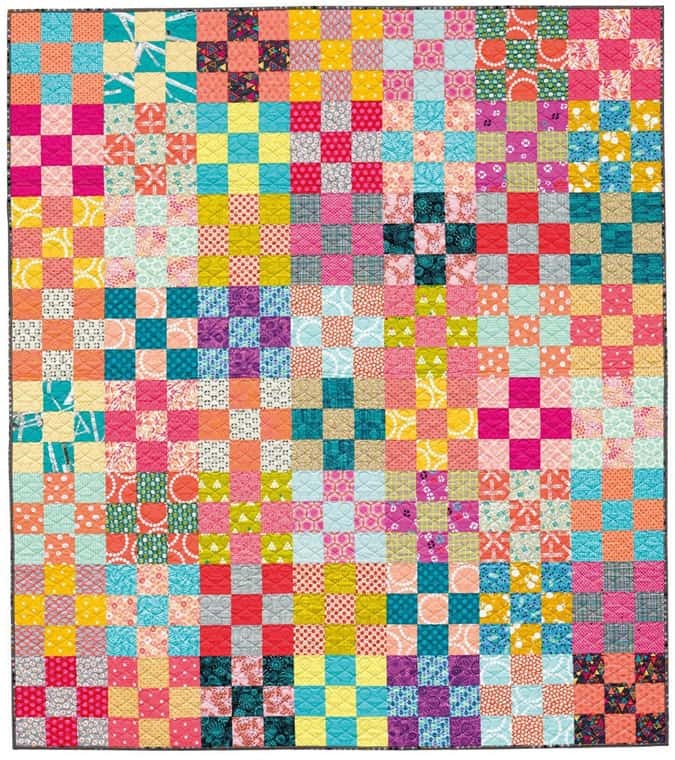 * (affiliate) which takes the simple nine-patch block and breaks down the steps in order to create beautiful quilts. I recommend this book because it’s a compilation of different variations of the nine patch quilt block reimagined by a variety of quilters. Start by sorting some scraps into lighter value and darker value piles. Be sure to press with an iron. 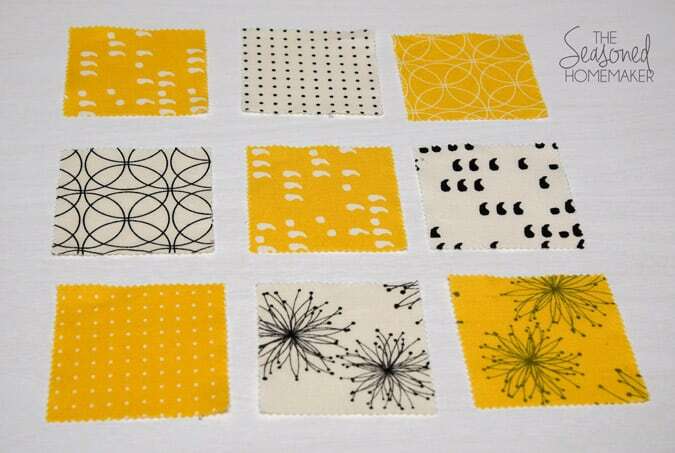 Cut the scraps into 4″ or 5″ squares. 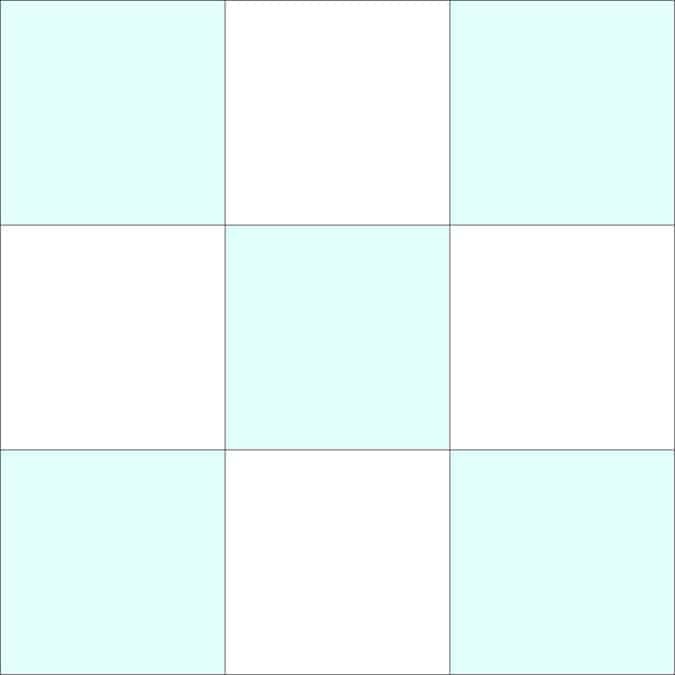 Start laying out the squares to form nine-patch checkerboards. When you are satisfied with the layout, begin stitching together the squares into nine-patch blocks as illustrated above. Connect blocks until you have a quilt. Now, doesn’t this sound fun! And, your scraps can now be converted into beautiful quilts. PLUS, I'll send you a downloadable PDF of the Quilting Beginner Resource Guide. Soon, you'll be making quilts for everyone you know! I love the patch work quilts. Going to make a friend one back home in Michigan. She is cold. 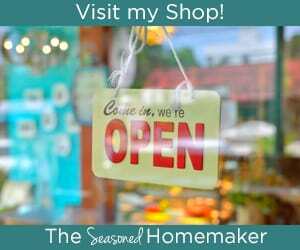 I am so delighted to have subscribed to Seasoned Homemaker, and having so much fun already. I love the non-nonsense, practical approach and my reaction to the projects I’ve read about is “I want to do it now”. There are so many blogs etc out there it’s bewildering , but I will stick with this one because I’m certain to learn a lot, sew a lot and who knows, finish a lot. I love the background to the nine patch and will start this asap! Thank you, Grace, for your kind words. You really nailed it. My goal is not to overwhelm you, but point you towards your own sewing goals – and offer any help along the way. Here’s to getting more finished in 2017! Thanks, Leslie, you are the best! I needed this little shot in the arm to get me back into quilting. Just the thing I need. Have been sluggish since the holidays, so a good jumpstart. i saw this and just loved it…. i make baby quilts for my ever increasing family… and they all seem to love Great-aunt Carol’s quilts…. this particular pattern looks complicated but is so simple and elegant…. thank you for sharing it!! Thank you for this great post! I love learning about the history of – well, everything! The 9-patch quilt looks so easy and do-able! My sewing goal this year is to make myself something wearable at least every month, but maybe next year a new wuilt will be my priority! I love this quilt. Love the fabrics. Another great post. Thanks, Leslie. Wonderful, was wondering what to do with a charm pack I saw online but when it arrived it had 5″ squares. But by joining a plain material I can also use as a border that would be ideal. Thank you so much for this. Looks and sound easy enough for me. I think I’ll be trying this one. I have a stash of fabric that I need to use to make something useful. Your directions are easy to follow, looking forward to more new things to try. No one ever talks about what to do after you have the quilt assembled. How do you get the stitching in. I do not have a quilting machine. Just a regular sewing machine. Funny you should mention that. I will be doing a post on this in a week or two. So cool! My husband’s paternal grandmother left about a dozen quilt tops when she passed, that were spread out amongst her descendants and 9 brothers and sisters. They are a precious memory. I’ve wanted to start quilting, but have been intimidated. But this looks…doable! Thanks so much for posting this pattern. I can’t wait to see the other posts in the series. I love 4 patch and 9 patch blocks. I love to make them when I don’t know what to sew. I cut up my scraps and sit at the treadle and just sew away. Very relaxing, and yes—they make beautiful quilts! Hi I love this quilt and would like to try it as my first one. What i would like to know is how do you do the circular design around the quilt accurately? I am working on a tutorial that teaches this. It should be available soon.